Colorado SkySox: The logo set was re-designed in 2008 and is a drastic improvement over the previous scheme. Although I don't generally care for teams moving to a navy/red scheme, as it is overused in baseball, the colors (in this case) represent patriotism as Colorado Springs is home to multiple Air Force bases, in addition to the USOC. The primary logo is a mountain with eyes above a SKY SOX wordmark. Two wordmarks and two cap monograms round out the set. The set, as a whole, is beautifully rendered with the clouds around the mountain making eyebrows, and the detail of the type giving the scheme a unique, western feel. New Orleans Zephyrs: The team was re-branded last fall, and the end result is a significant improvement over the previous set. However, the color scheme could be more "Mardi Gras" inspired, possibly using a green/gold or purple/gold scheme, which would be far more unique and fitting. In addition, the bat in the logo could be taller to better reflect a fleur-de-lis. Oklahoma City RedHawks: The primary logo is quite an upgrade over the previous incarnation, especially when you consider the trouble some teams have had in dealing with the OKC initials. The secondary logos round out the set very nicely, as the monogram matches the primary and the hawk adds a "face" or mascot to the franchise. The end result is an old-timey ballpark feel with expert craftsmanship. 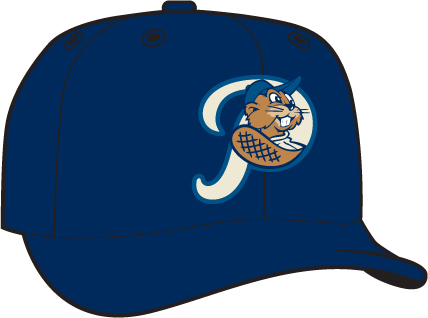 Portland Beavers: This has to be one of my favorite re-branding efforts in Minor League Baseball. First off, the name is great: it speaks to the local population, while giving the team a unique mascot within the PCL and all of MiLB. But the old logo wasn't quite as polished as it could have been. The colors weren't bad, but they were very original either. 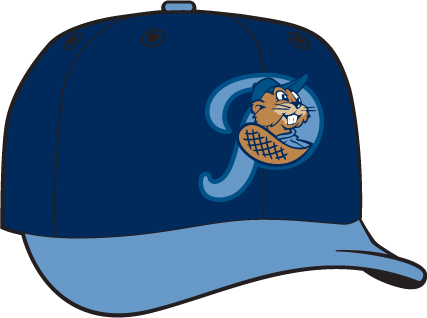 The new logo, however, uses the color scheme to show the team's affiliation to the parent club (the Padres), while establishing a unique identity for the team. The beaver in the new logo has a timeless feel, as shown by the illustration style and the uniform the beaver is wearing. The logo set is rounded out by three P-logos and a circular logo. In addition, the jerseys bring some originality back to baseball by using a piping style that resembles the Stan Musial Cardinals. Lastly, the wordmark skillfully incorporates a beaver tail into the script. Reno Aces: The Triple-A affiliate of the Arizona Diamondbacks was formerly known as the Tuscon Sidewinders. 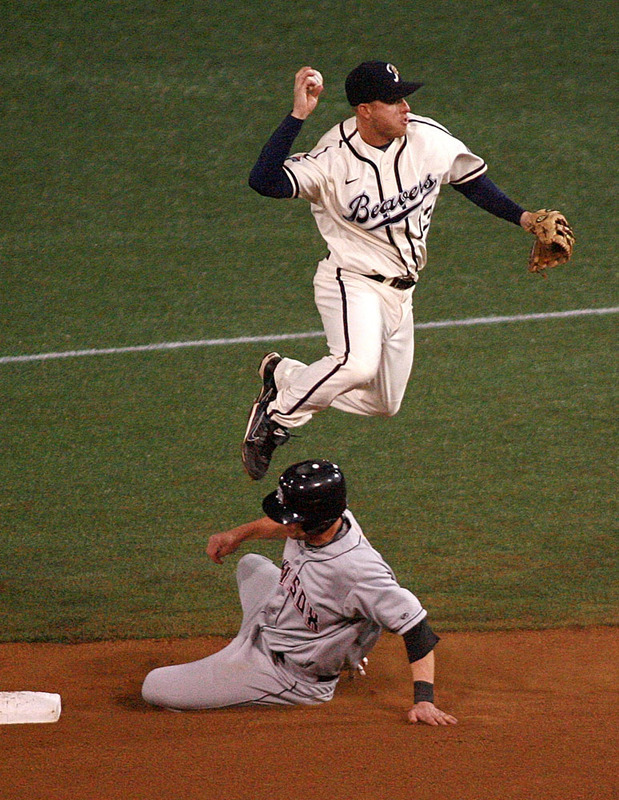 However, the team moved to Reno between the 2008 and 2009 seasons and were renamed the Reno Aces. Although I would have liked to see the team use a red/black/gold scheme in correlation with the playing card theme and parent club, I have to admit the overall design is rather impressive. The primary logo consists of an "Aces" script over a baseball, which may not sound all that original, but the beauty is in the details. The diamond in the A is a great subtlety, and ties into the card theme, the parent club, and more generally, the game of baseball. 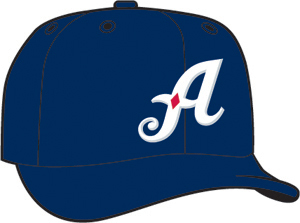 The caps use two versions of the A, while the team also uses a secondary logo of an A, spade, and a diamond with crossed bats. Round Rock Express: Once again, a great name. You might have a hard time guessing this logo was unveiled between the 2004 and 2005 seasons. It also comes with an E-Train logo and a Double-R mark to complement the primary. The designs, although not perfect, are fairly well crafted and use the train theme without overdoing it. This design will become far more popular once the public is introduced to Rojo Johnson. Albuquerque Isotopes: While I love the name, the design could be better. The primary logo features an A with electrons flying around it, and the style has a nice 1950s aesthetic to it. The part that truly bothers me, however, is the type. While it fits within the Simpsons theme, it just doesn't look like it belongs on a baseball uniform. In addition, the gradients are tricky, as they don't necessarily work with the Simpsons theme, and they pose potential production issues. I'm sure if the team tried, they could find a workmark that is in line with the Springfield inspiration but not as sloppy looking. Fresno Grizzlies: This one isn't terrible, it's just not that great. The color scheme is good, not overused. In the primary, the bear look a little off… for lack of a better word. And while it's an improvement over the previous version, something just doesn't seem right. The cap logo, however, is a good, albeit fairly common, idea. Las Vegas 51s: The primary logo has some issues: while the alien head is great, and the LAS VEGAS wordmark is good, the 51s type does the good parts no favors. In addition, the 51s atom logo doesn't say aliens; it seems like a 'Topes spin off. Lastly, the BP cap uses a western style LV that doesn't even remotely fit the sci-fi theme. If I were working on an update, I would simply re-do all the typography for the sake of consistency. Memphis Redbirds: The primary logo is a big part of why this team is in the "Bad" category. The colors aren't good either. It's never a good idea to combine navy and black, especially when the team is named the "Redbirds". In addition, the logo says absolutely nothing about the team name. It's just vintage for the sake of being vintage. The supporting marks don't match the primary at all, but at least they describe the team better. 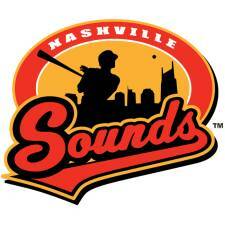 Nashville Sounds: The Brewers' Triple-A affiliate uses a color scheme of black, red, and yellow. But if your team is named the "Sounds" and it's located in the mecca of country music, shouldn't the color scheme be more rustic? Using brown or a typeface that inspires thoughts of ranching and twangy guitars would be a start. The overall package seems somewhat generic, especially when the overall concept could be very fun and much more specific. This branding effort comes off as a lost opportunity. Sacramento River Cats: It's not that the rendering of the primary logo is that bad, it's the type work and color scheme. The color scheme needs to be paired down, because as it is, the black, burgundy, royal, gold, and shades of grey are just too much. In addition, the type is trying too hard to be "wild". It looks dated. Salt Lake Bees: The colors are fitting, and the name is great, as Utah is the "Beehive State", but the primary logo leaves room for improvement. The rendering of the bee is cute, but it is more of a cartoon than a logo. In addition, logo-wise they will always be compared to a Burlington squad whose mark is far superior. The main issue (other than the bee rendering) is the type too closely resembles the Pirates, and the team is affiliated with the Angels. This cap logo illustrates the point nicely. Iowa Cubs: Wow! The primary logo takes the existing Cubs mark and slaps a grocery store script "Iowa" next to it. I realize there is a lot of equity in the Cubs name, but this doesn't do it justice. With such a long history to pick through, you'd think the Iowa club could find something more appropriate, or even put a new spin on the classic identity. To make things worse, their home cap says IOWA in plain block letters. At least the generic I on the road cap isn't as gaudy, but it's not much better either. If they tried, they could have a great scheme. Omaha Royals: If you thought the I-Cubs were bad, look at this! It's not much more than clip art. Maybe it's the three outlines on the "Royals" wordmark, or the generic bat that could use a twin to balance the mark, but this might just be the worst sports logo I've ever seen. And they put it on a hat! I've seen high school with better logo sets, and I'm not kidding at all. A simple crown and some rational use of color would greatly improve this. At least the new BP cap is a step in the right direction. 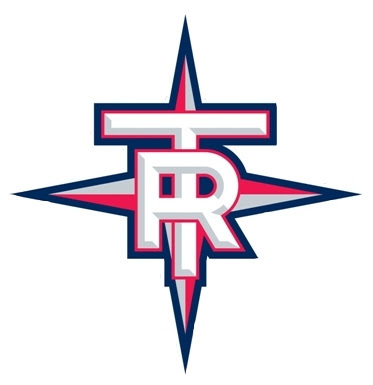 Tacoma Rainiers: It couldn't get much worse, but it didn't exactly get much better. The compass rose is borrowed from the parent-club Mariners, but the navy and red seem generic and not at all appropriate. A color scheme that actually reminded viewers of the Pacific Northwest would have helped. In addition, the type could be more… anything but plain, although the bevel is executed well. The alternate logo is decent, but it only appears on the road cap, and the T doesn't match the typography in the TR-compass logo. Today's design section is once again a double-play. 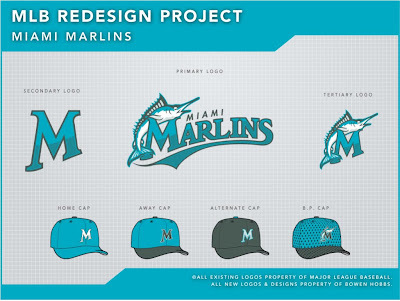 First up, we have the Brewers' current opponent, the Florida Marlins. Since they will move to a new ballpark and change their name to the Miami Marlins, I felt it was appropriate to start there. I kept much of the existing identity but modified it. I removed the black and replaced it with a charcoal grey that features a slight teal hue. The marlin is streamlined from this to the version below. The type features a two-tone effect that mimics the aquatic theme. 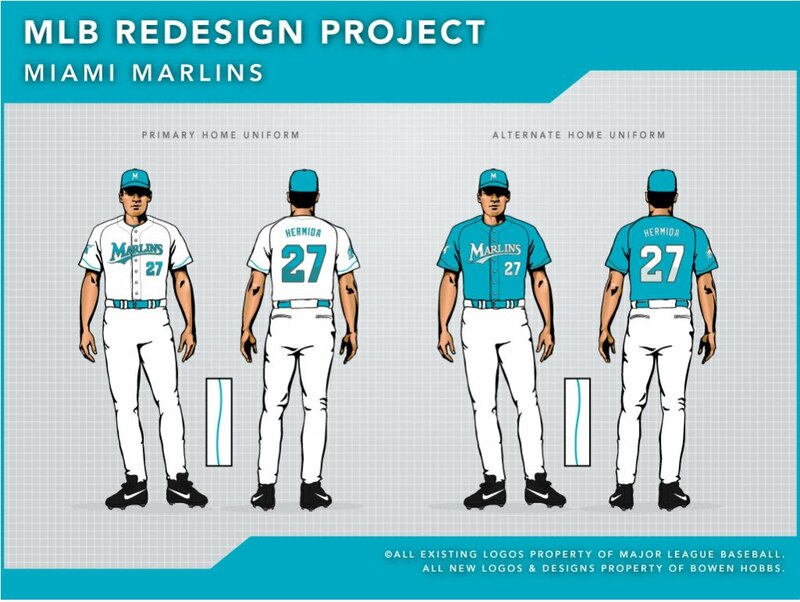 The secondary logo is a standalone M, to be worn on the caps, while the tertiary logo adds the marlin and appears on the BP caps and the right sleeves of the jerseys. 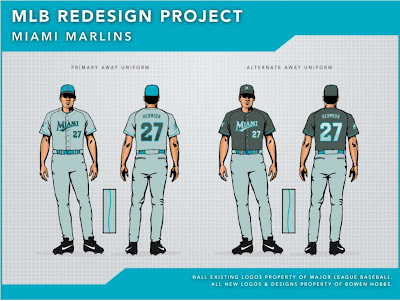 I chose the right sleeve because the current Marlins jerseys place the logo on the left sleeve and the marlin faces backward, which is a sign of cowardice. The home sets rely on the team's signature color, teal. The uniforms feature "wavy" sleeve and pant piping and two-tone type work to, once again, enhance the aquatic theme. The home alternate jersey is a teal version of the white jersey. The primary road uniforms utilize a teal cap with a charcoal brim while the jerseys feature charcoal grey type. The road alternates are charcoal-based with charcoal hats and jerseys. 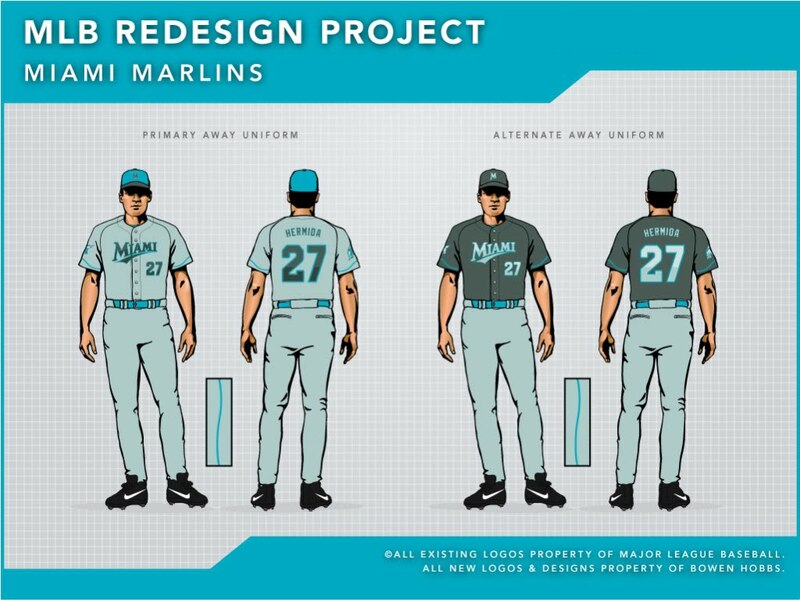 The Sunday Alternate uniform is similar to the primary home set, but with the charcoal hat and charcoal type. Next up, we have the Kansas City Royals. After studying their Omaha counterpart, I decided to show what a Royals team could be. And to be honest, most of the design could apply to the Omaha club with come edited type work. The color scheme start with an ultramarine blue, which is closer to purple, the color of royalty. It is complemented by cerulean and golds. 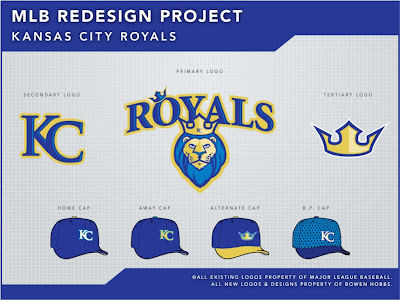 The primary logo is made up of a lion wearing a crown under a ROYALS wordmark. The secondary is a modified KC logo, to be worn on the caps, and the tertiary is a crown that appears on the alternate caps. 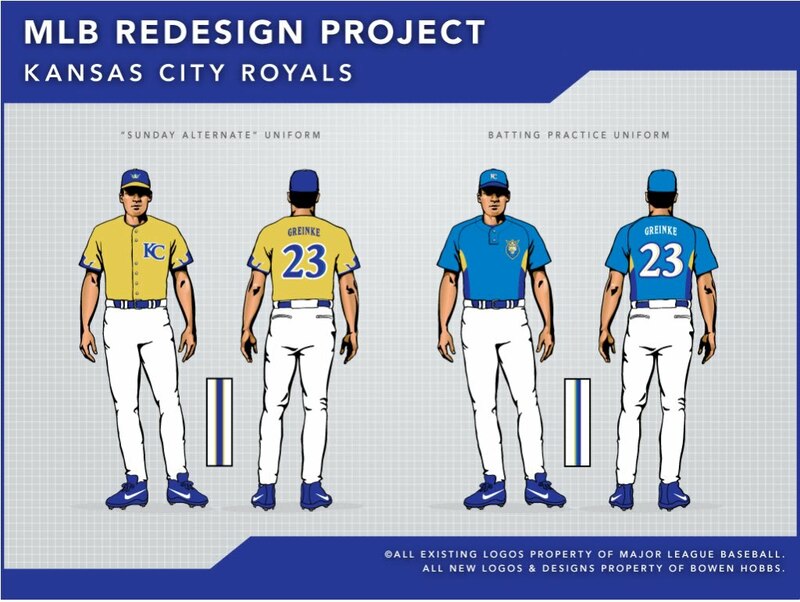 The home uniforms use a tricolor trim and combine it with the ROYALS wordmark and a standalone lion head on the sleeve. The home alternate is ultramarine with white type. For the roads, I started with a sand color for the base. 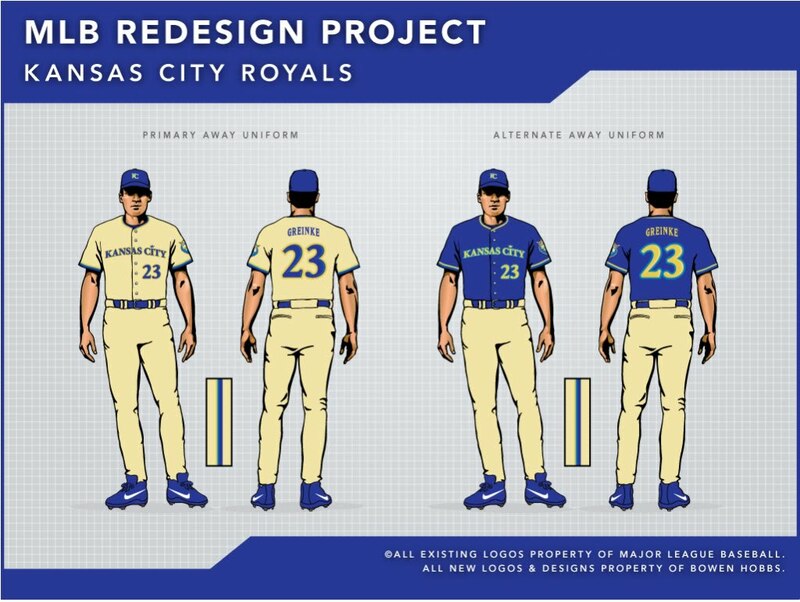 Both away jerseys feature a KANSAS CITY script that corresponds to the ROYALS script from the logo, complete with a crown dotting the I. The away alternate features gold type on an ultramarine jersey. The Sunday Alternate is far more modern than most of the Sunday sets I've put together, as it features blue sleeve inserts in the shape of a crown on a gold jersey. The KC logo appears on the left chest, since the crown logo is on the caps. Lastly, the pant striping is altered from the primary sets to correspond to the gold jerseys. Feel free to comment on the branding efforts of the Pacific Coast League, the double play designs above, or anything related to sports branding.